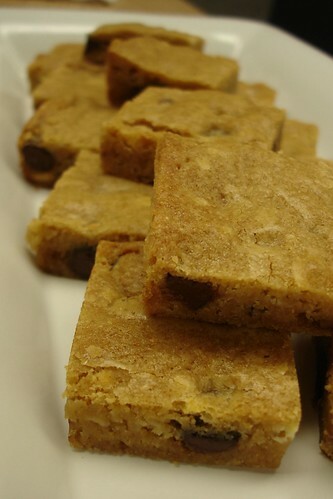 I made this batch of Blondies from the American Classics book (page 327) by the editors of Cook's Illustrated magazine. 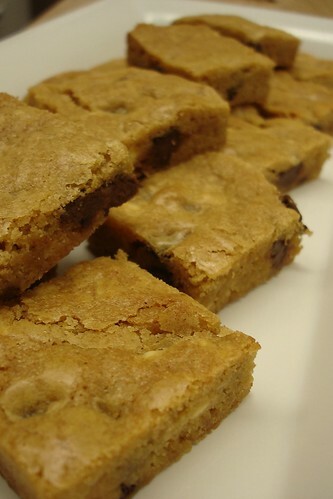 According to Cook's Illustrated, "Blondies are a first cousin to both brownies and chocolate chip cookies." As always, Cook's tested a gazillion batches saving the best to publish. This one used all-purpose flour, melted butter, light brown sugar, eggs, semisweet chocolate chips, and white chocolate chips. I omitted the pecans for this recipe. The recipe was really easy to make because I didn't need to bring anything to room temperature. That's one of my problems with working and trying to bake... and bring in the freshest products into the office. I like to get up early in the morning and bake, but having to get up extra early to remove the butter from the refrigerator can be a bit tedious and cause sleep deprivation. 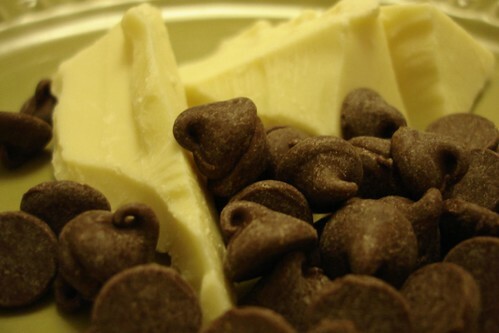 For this recipe, I measured all the ingredients the night before and set the clock for 5 a.m.
People at work seem to like them... but they remind me too much of its cousin, the chocolate chip bar cookie. To be quite honest, I would rather have a brownie. Mmmm! Yummy!!! I just saw creme brulee created on Queer Eye... Now, I want to eat creme brulee every night! I used to toast mini-marshmallows over candle flames as a kid : ). Yes, I used them to make mini-smores. Yes, I went through a pre-adolescent chubby phase.